Kamandi Challenge no. 1 begins with a prologue: an ordinary teenage boy (as yet unnamed) is running late for school, gently encouraged by his grandmother. The set-up is classic, reminiscent of Peter Parker and his Aunt May, or any number of fairy tales. Threading his way through an idyllic small town after missing the bus, the boy encounters similarly benevolent townsfolk (including a couple named after Kamandi creator and “king of comics” Jack Kirby, and his longtime inker Mike Royer), all of whom know him and are watching out for him. Their solicitous treatment turns out to be more than mere small-town friendliness, however, when a piece of the sky cracks off and falls to the ground: the boy’s home is actually an enclosed dome, a Truman Show-style simulation of a normal life, and that shelter has finally been pierced by his (unknown, at least to him) enemies. The friends and neighbors who so recently were encouraging him to get to school are suddenly armed and ready to fight off the threat; they are, in fact, robots, programmed solely to protect the boy! Attacked by one of the invaders, the boy is horrified to come face to face with a humanoid, talking rat. There is so much about the outside world that he did not suspect! At home, “grandmother” shoves him into a mysterious glowing chamber, a sort of stasis capsule, before fighting off the intruders with one final explosion. In his artificial sleep, the boy receives more instruction, including an order to “remember Command D”–not, apparently, the name of the bunker in which he was raised, as in the original Kamandi stories, but perhaps a code or protocol. After an indeterminate time in suspended animation (but long enough for the boy’s hair to grow long), the chamber is opened and the boy is reawakened by manlike tigers, scouts for the Tiger Empire ruled by King Caesar. 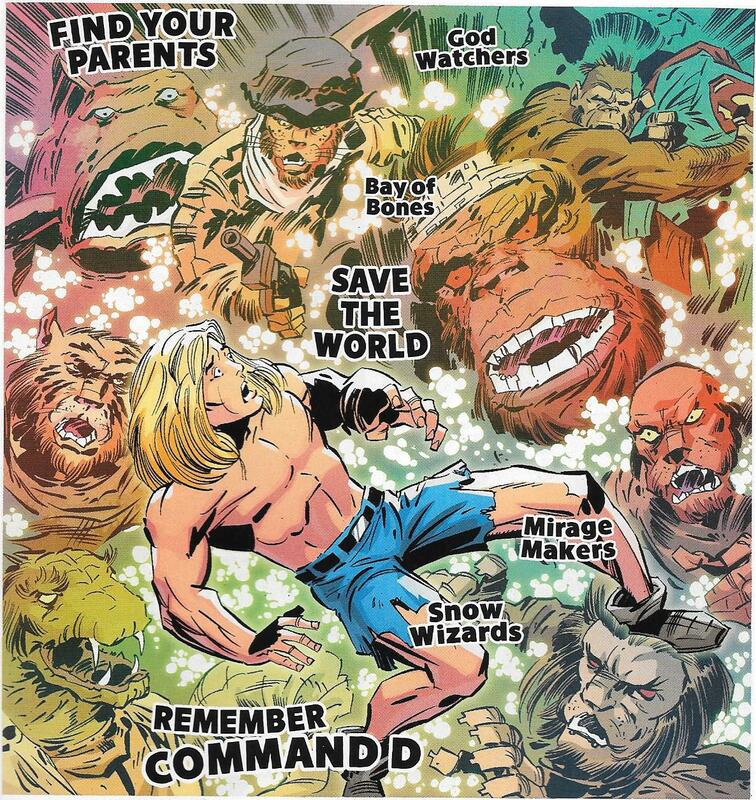 The tigers assume that the phrase the boy keeps muttering, “Command D,” is his name, and thus Kamandi is christened, a new name for a new world. Taken for a savage animal, Kamandi is thrown in a paddy wagon and driven to Tiger City where he will fight in Caesar’s gladiatorial arena. His protests are interpreted as the unintelligent parroting of a wild beast who has learned to imitate speech–everyone knows “animals” can’t talk. Thrust into the arena, Kamandi is pitted against “Tiny,” a giant, Kong-like gorilla. On that cliffhanger the prologue ends, with Kamandi (and the reader) given a crash course in the premise of the series, both its story (Kamandi is referred to as “the last boy on earth” a couple of times, and one of the robot guardians insists that he is to be protected as if the fate of the world depends on it; and we get an introduction to the upside-down “animals ruling over humans” formula that was also essential to the series) and the test of the creators’ inventive powers: “What’s the matter, boy? Afraid of a little challenge?” one of the tigers jeers Kamandi as he throws him into the arena. Those might as well be Dan DiDio’s words to the next team to pick up the story: get him out of this, if you can, guys. Dan DiDio is both the architect of this series and current Co-Publisher of DC Comics, so his influence is felt far beyond the stories on which he has writing credits, but I personally associate him with the New 52 version of OMAC that he and artist Keith Giffen collaborated on in 2011. OMAC, the “One-Man Army Corps,” was another creation of Jack Kirby’s, and the liberties “The Rules” takes with Kamandi’s origin story has some similarities to the way DiDio and Giffen expanded on OMAC, with an emphasis on mysterious conspiracies and secret identities, not to mention all those robots. Visually, Giffen and Koblish are in similar territory, with an updated Kirby-by-way-of-Kubert style that makes for a good introduction to this new version of the character. In the next chapter, Tiny attacks Kamandi; the tiger people in the stands cheer on the fighters and assume that the puny human will be no match for the champion ape. Instead of tricking Tiny into throwing him into the stands, as DiDio had suggested, Kamandi lures Tiny into an electrified wall surrounding the arena, knocking him out and proving himself more clever than the tigers had originally thought. Suddenly the “wild animal” has value, and Prince Tuftan turns Kamandi over to Dr. Canus, a humanoid dog, for training as a full-time gladiator. To Canus, however, Kamandi is still an animal and the boy is kept on a leash as he is shown around the tigers’ city. 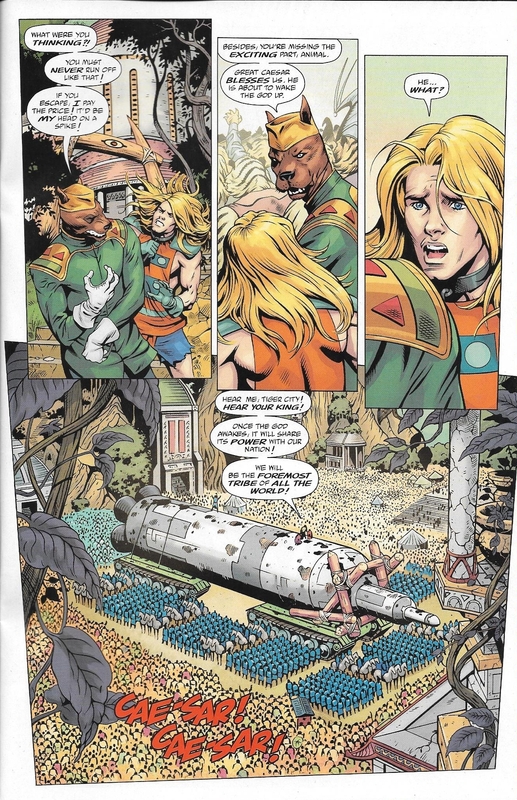 Kamandi and Canus witness the return of King Caesar, back from a victorious campaign against the leopards, and bearing with him military weapons taken as the spoils of war, including a giant missile. Kamandi breaks away from Canus and investigates the forbidden Hall of War, an enormous stockpile of weapons from the old, human world. (Is the eye-shaped insignia seen above the Hall entrance and elsewhere a reference to OMAC’s Brother Eye, a seed for later writers to pick up on, or just coincidence?) Attacked by flying jackdaw guards, Kamandi almost escapes but is recaptured by Canus, who emphasizes that he’ll pay with his own life if Kamandi escapes on his watch. They return to the main square to witness King Caesar attempting to “awaken” the recovered nuclear missile, taking it for a god of the ancients. Kamandi recognizes the missile for what it is and tries to warn the tigers about the danger it poses, but he is too late: King Caesar has armed the warhead and set it on a countdown for detonation! Unless Kamandi can halt the countdown, he–and everyone else–has only five minutes to live! “K–is for ‘Kill’!” (gotta love comic book titles) continues the remix spirit of “The Rules,” hitting the beats of the original classic stories but combining elements in different ways in the interest of telling a new story: “Tiny,” introduced in “The Rules,” appeared in the original series (Kamandi no. 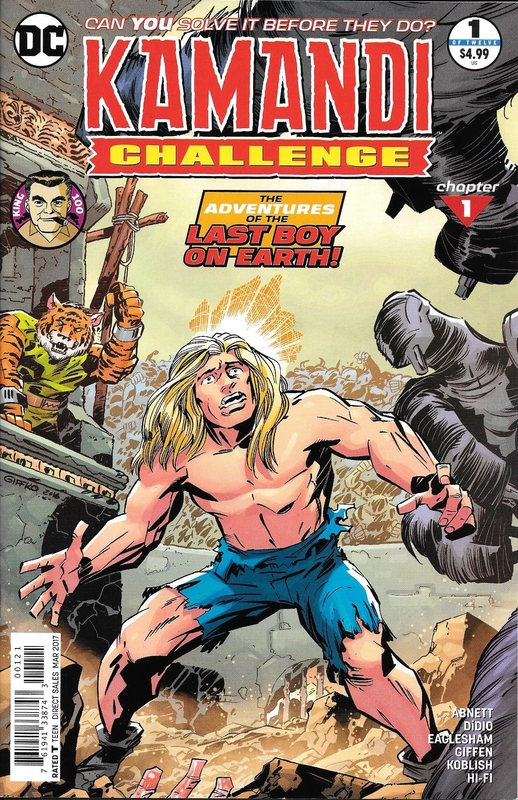 7, where the similarity to King Kong was both more explicit and more tragic); likewise, in the original series Kamandi’s first stop after escaping his bunker was the Tiger Empire, where he was forced to fight as a gladiator (the orange and blue tunic he wears in this chapter is a nod to his costume in that episode), and Dr. Canus was one of the first friends he made in the post-human world. 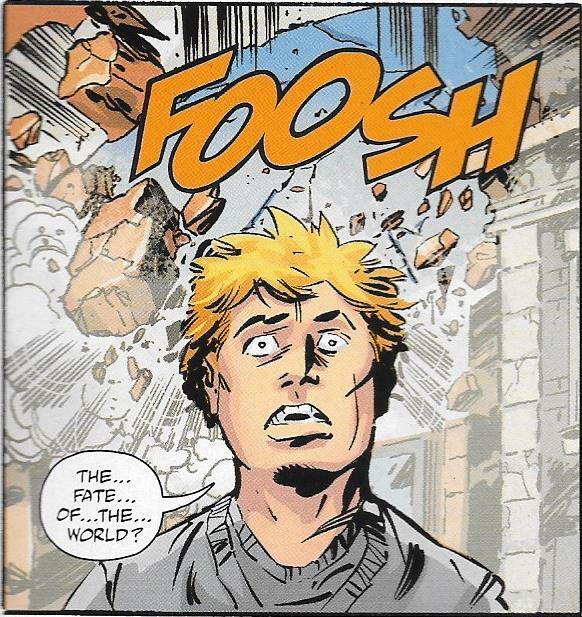 In “K–is for ‘Kill’!,” Canus is more skeptical of Kamandi than in the original stories, and the political realities of the Tiger Empire are more explicitly drawn: not only does Canus’ life depend on serving Caesar, he openly admires Caesar’s strength and has wholeheartedly adopted the tigers’ martial ethos. “War is our way of life and our salvation,” he tells Kamandi. Elsewhere it is made clear that the arena serves to keep the people occupied and happy, and that Prince Tuftan, who runs the city in his father’s frequent absence, is eager to prove himself. This chapter also highlights the series’ similarities (never far from the surface) to the Planet of the Apes movies: examining Kamandi’s backpack, Canus asks, “Why would an animal have books?”, echoing Charlton Heston’s famous question, “Doctor, would an ape make a human doll that talks?” King Caesar’s attempt to commune with the godlike nuclear missile (an element present in Kirby’s original) echoes the underground cult in Beneath the Planet of the Apes. Of course, the motifs of captivity, barbarism ascendant, and the worship of ancient weapons and relics are common in post-apocalyptic stories, so this observation is intended in the spirit of comparison rather than criticism: Prince Tuftan’s assumption that Kamandi simply stole his books illustrates just how far down the evolutionary ladder humanity has fallen, especially for a first-time reader who is exploring Kamandi’s world alongside him. Finally, Dale Eaglesham’s art in this chapter is particularly appropriate, capturing the classic sense of adventure and exoticism like an old-school Sunday comic strip. Tiger City is a richly-realized environment, full of stone temples, statues, and walkways, thick with vines and palms. The characters, including the animals, are expressively rendered and fluid in a way that’s not very Kirby-like at all but is quite beautiful; it’s a great fit for the material.